how to solve word problems about cylinders. How to find the Volume of Solid Cylinders? In the above figure, the radius of the circular base is r and the height is h.
The volume of the cylinder is the area of the base × height. Since the base is a circle and the area of a circle is πr2 then the volume of the cylinder is πr2 × h.
Calculate surface area of cylinders. a) the area of the base is 30 cm 2 and the height is 6 cm. b) the radius of the base is 14 cm and the height is 10 cm. 1. Find the volume of cylinder with radius of 5.5 feet and a height of 11.4 feet. 2. Find the volume of cylinder with diameter of 12 inches and a height of 29 inches. How to find the volume of a right cylinder? 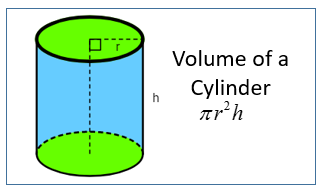 How to find the volume of Hollow Cylinders? Sometimes you may be required to calculate the volume of a hollow cylinder or tube or pipe. The figure shows a section of a metal pipe. Given the internal radius of the pipe is 2 cm, the external radius is 2.4 cm and the length of the pipe is 10 cm. Find the volume of the metal used. How to calculate the volume of the shaded area of a cylinder? The shape forms a tube or pipe. How to solve word problems about cylinders? These videos show how to solve word problems about cylinders. 1. A cylindrical can is packed in a box. What is the volume of empty space between the can and the box? 2. Emma has two prism-shaped containers. One has a volume of 9 1/3 cubic feet. How many smaller prisms would it take to fill the larger prism? How to find the volume of a cylinder in a prism? A cylindrical can is packed securely in a box. a) Find the radius and height of the can. b) What is the volume of the empty space between the can and the box? c) Find the ratio of the volume of the can to the volume of the box.